"University" from Karl Shapiro's Person, Place and Thing. [New York]: Reynal & Hitchcock, 1942. In 1932 Karl Shapiro stayed a brief semester at the University of Virginia where he generally ignored his studies to write poetry. Years later in The Younger Son he remembered mountaineers coming to the door of his brother's room on the Lawn selling whiskey in Mason jars, and how when passing the room which once belonged to Edgar Allan Poe "he would always pause and touch the door with the flat of his hand, like touching a mezuza, and if no one was looking, would kiss his hand." 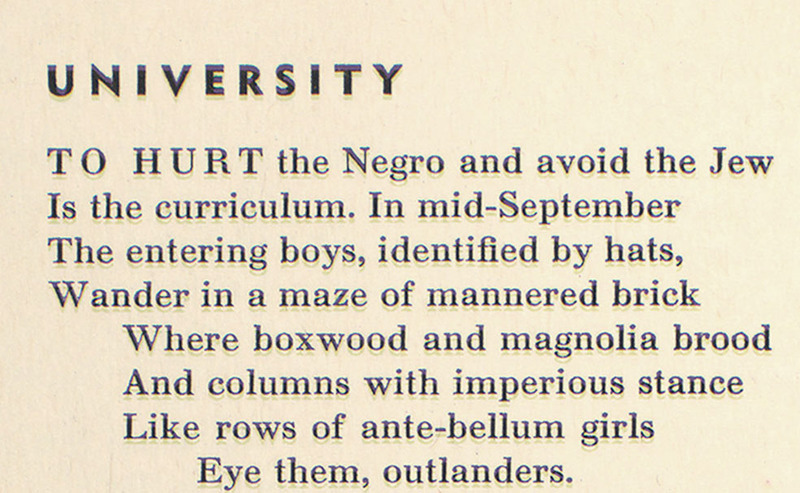 He later portrayed the intense and dehumanizing social snobbery at Virginia in his poem "University." In 1946 alumnus [Francis] Coleman Rosenberger solicited unpublished works for the British Poetry Quarterly "to show what is going on in American poetry today." Shapiro sent him "An Urn of Ashes." Shapiro later gave Rosenberger permission to anthologize the poem in a postcard that also announced the birth of his son John.